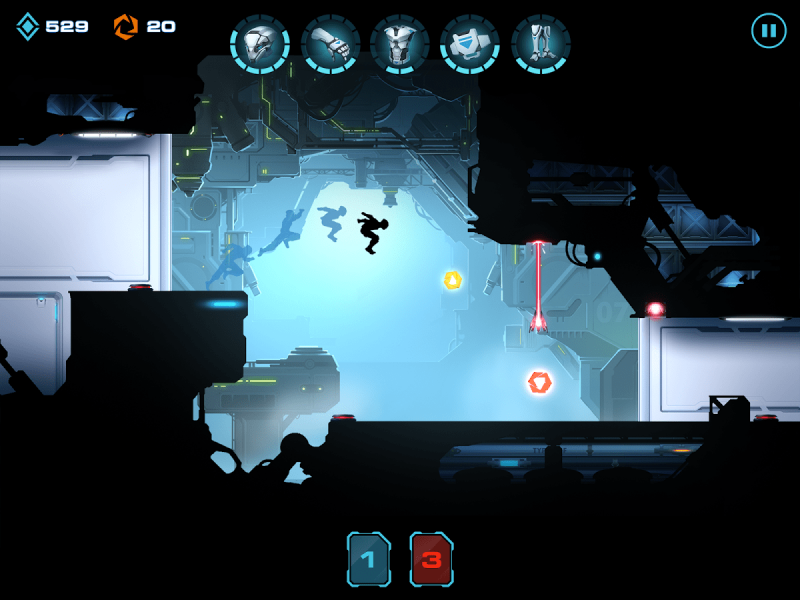 Vector 2 is a sequel to the well-known and much-loved Vector, by the same developer Nekki. I am sure anyone who found the first game a blast is already playing Vector 2 or is about to download it. We loved Vector and included it on our list of games with awesome design (Top 25 Games with Gorgeously Dark and Atmospheric Design, to be specific). Now that we’re playing Vector 2, excitement is there, but it’s diminishing with every replay. Bear with me. Vector 2 seems to add some flesh onto the minimalist bones of the first games, and the backgrounds and details of the environment look more crisp. However, it’s not all gold that glitters. The runner looks blocky. The guy in the first game looked classy, even though the black silhouette was all you could see. Vector 2 gives him some ammo, but takes away the classy looks, and now he’s just a stuffed puppet. The backgrounds lack variety. 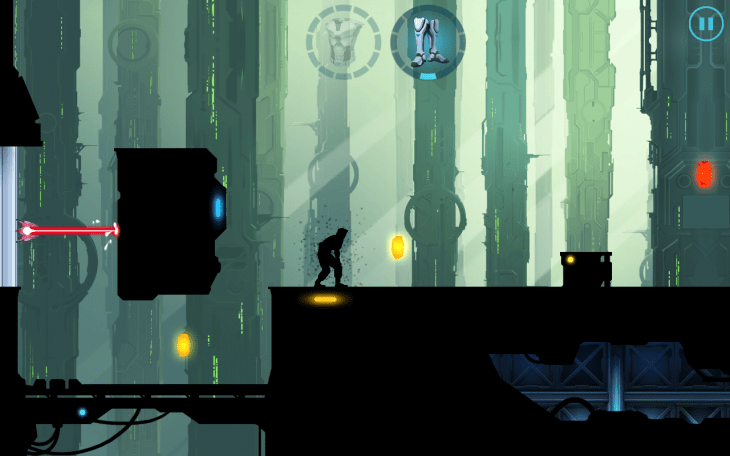 And if you think the levels are randomly generated, you’re wrong. You will be seeing more of the same here, unfortunately. This time around, no one is chasing the protagonist. All there is to kill him is a set of lasers and bombs, bombs and lasers. He would fall on his back awkwardly, or bump his head against a sharp edge, but that won’t even make him dizzy. Provided there is nobody chasing the guy, the auto-scroll seems odd. 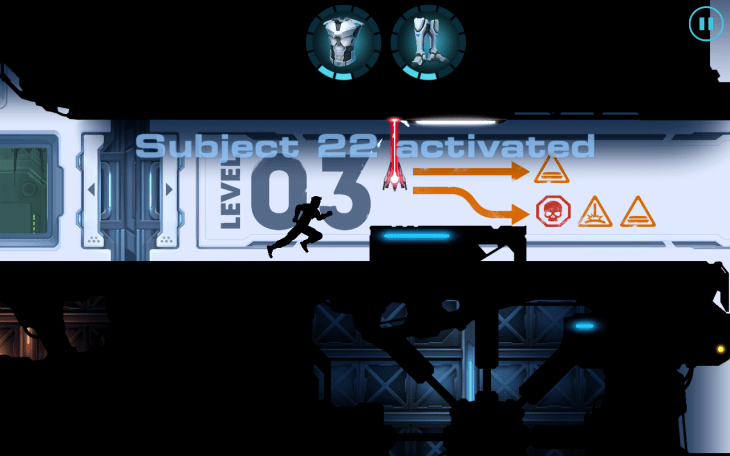 Vector 2 is still a horizontal auto-scroll in 2D silhouette graphics, that sees you controlling a parkour runner as he tries to… no idea, there is no story here. You may assume he’s a clone of a clone, like Alice in Resident Evil, but there is literally no story-based motivation to keep running other than for the sake of running. You control the runner by swiping up to jump, down to slide beneath an obstacle, or left to right to give him a speed boost, which seems redundant since there is nobody chasing him. The controls could have been great if it weren’t for a lag in the game’s registering the swipes sometimes. I am getting regularly fried because the game won’t recognize my swipe down after the runner lands after a jump. As a result, some contraptions are lethal due to sheer lagging. This is annoying. 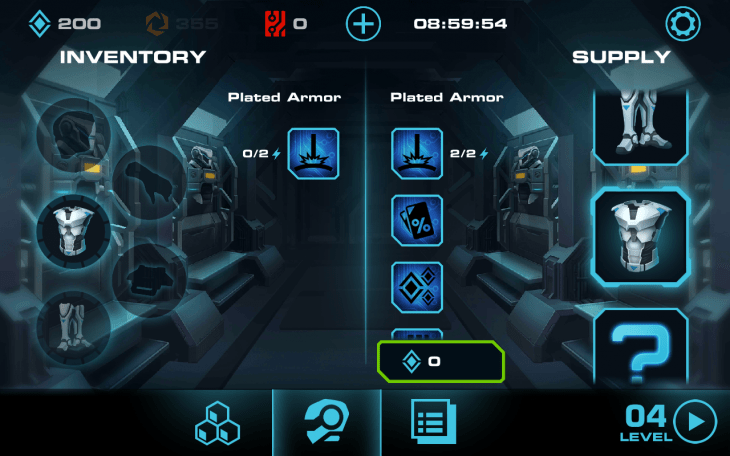 More so, when you realize the game’s UI makes no sense. There is a journal (I get that more or less because intuitively you feel there should be missions and quests), then there is a window to Equip, one for the Upgrade Kits and something that’s called a Research Terminal. However, I never know where I am, or what I am supposed to do when I am outside the running track. The game has some pattern and perhaps it has a rhyme and reason for throwing me to level 1 out of the blue after I got toasted on level 6. But in a few moments I can play level 6 again (some kind of the cool down timer that prevents you from replaying the same levels unless you pay, or wait). It was supposed to be a fun game, but when a time killer urges you to browse for the explanation of what everything in the UI is, it’s not fun anymore. Moreover, something is seriously messed up with the UI since I am not the only one having trouble sorting it out. For one, the upgrade process in itself is a bloody mess. I can see the runner has several items on him – gloves, helmet, boots, vest, etc. Each item can be upgraded with funny rectangular tokens I collect when running. The Research Terminal is where you produce something that adds a jolt to one item in the inventory. However, the purpose of each rectangular thingie is unclear, its name is unclear, the cost of production is unclear, nor is the effect of the said upgrade. Moreover, each upgrade seems to be a one-time consumable because the next run it’s not there. The stages are divided into “Research Protocols,” which are counter-intuitively placed in the Equip Window. You would think it’s for getting dressed, but this is where you choose the stages to run. And these Research Protocols correspond to different game levels. The first protocol, whatever its name, is for levels 1-2, the second is for 3-4, the third is for 5-6, and so on. Sometimes you run out of something that lets you run in a certain protocol, and you can get back to the previous protocols until you run out of this something in them, too. If any of this sounds unnecessarily complicated in a 2D side-scrolling parkour runner, it’s because it is. Vector was a blast of a minimalist, yet intense runner while Vector 2 is like Helena Bonham Carter, a great actress and a beautiful woman with an inexplicable capability of choosing very weird outfits that make her look like Edward Scissorhands. 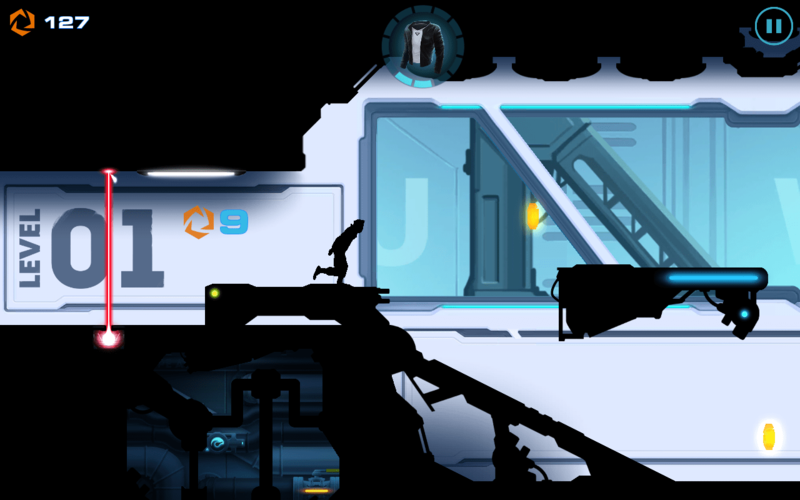 Likewise, there are just too many odd things that get in the way of fun to like Vector 2 as it is now. I’ve been playing it until I got fed up with the lags, the counter-intuitive UI, the need to watch ads because my runner dies because the game lags, and the unattractive runner himself. And it’s a shame because the developers seemed to have tried to fix what was never broken in the first place. That said, I never felt there was a paywall simply because I never felt too compelled to invest into anything. All things considered, I still believe you will enjoy Vector 2 to some extent. I totally recommend you to try it, especially since it’s a free download. However, the replay value is seriously hampered by the above-mentioned rough edges. Your mileage may vary if you haven’t played the first game, or you just think otherwise. At the end of the day Vector 2 is a decent time killer for a couple of commute trips, but the lack of variety in maps, performance lag, the convoluted UI and in-game currencies and items that make no sense kind of pile up and make it a debatable fun. At the end of the day Vector 2 is a decent time killer for a couple of commute trips, but the lack of variety in maps, performance lag, the convoluted UI and in-game currencies and items that make no sense kind of pile up and make it a debatable fun.